This past week we lost two giants whose lives were not only marked by their own successes and failures, but also by their service and dedication to ensure that others had those same opportunities for success. They were women who didn’t allow social norms to dictate their opinions or actions. 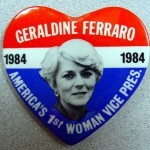 I sometimes wonder if Elizabeth Taylor (1932-2011) and Geraldine Ferraro (1935-2011) ever crossed paths? They were so different, yet also so much the same. One was married once, the other eight times. One was in Hollywood, the other in our Nation’s Capital. Both were working mothers. Ferraro stood by her husband and son during extremely difficult times, despite the impact to her career and Elizabeth Taylor was said to be a wonderful mother & step-mother (according to Carrie Fischer) and both were known as tireless advocates for their friends. Its funny that both Elizabeth Taylor and Geraldine Ferraro are forever engraved in my mind as women who truly had grit, because of things they did in 1984 – the year of my birth. Both these women paved a path for us . . . the least we can do is fill in a pot hole every now and then to make sure the road continues to allow safe passage for all.